For us Andean Encounters it is a pleasure to share with you our beautiful life, we have more than 4 years helping travellers sharing our work with a lot of commitment and love, it really stopped being a job and now it is our way of life, on which we focus in the dissemination and practice of responsible and sustainable tourism for our local people, we are pretty sure that the Andean Local would has a very deep impact in your lives which continues to teach us every day, thanks to my beautiful place that is my home thanks to Qosqo (center) ourCusco. Our tour Inca Alternative Puma Marca – Ollantanytambo that many visitors doen`t know about, the exact purpose of its construction is still unknown, but this site could have been considered a kind of bastion, fortress or access point to the Sacred Valley from the Antisuyo. Puma marca is also said to be a construction of Wari origin, which proves this fact by the designs of its construction, since this type of design can be seen in Pikillaqta (Wari building) in the South Valley not far from Cusco. This has a privileged view of the Valleys of Patacancha and Yuracacmayo a magnificent walk with mystical and majestic views, and being with us the local Andean, we can also see the local people even using this days this Incan canals to irrigate their crops, which It reflects the quality of their engineer, you will really feel as if you were discovering this place for the first time !!! Passing architectural structures, incredible terraces and more certainly one of the finest examples that I have seen in power places in Cuzco Peru, we will also find Inca canals with perfectly designed architecture, a hidden paradise green Tunnels that at times you feel as if you were in another place, following this Inca Trail we will also have the Opportunity to see an Incan Pyramid only known by the Local Andean , we are always oppening new adventures to share it with you for you to experience something more special than a simple trip, an experience which brings connection with nature ( Pachamama), I wonder what was Pumamarca many years ago? Thus, the place of Pumamarca keeps a great mystery and mysticism since this road connects with the temple of the Sun in Ollantayambo makes it even more mysterious as far as history is concerned. 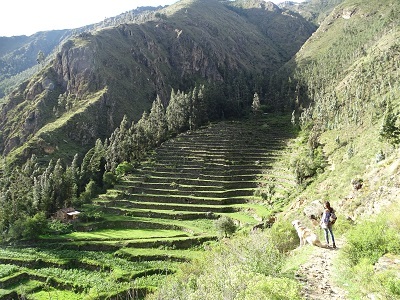 You are cordially invited to know this Alternative Inca Trail and make a truly responsible and sustainable trip, Andean encounters are looking forward to meet you!